In economics, there are probably very few empirical results as persistent as the distance effect on bilateral trade. In an influential article, Anne-Célia Disdier and Keith Head analysed close to 1500 estimated distance effects in more than 100 papers. Their findings indicate that the negative impact of distance on trade increased during the middle of the twentieth century, and has remained high ever since. Contrary to arguments proclaiming hyper-globalisation as the new normal, this negative relationship between distance and trade persists today. As Colin Hay has argued, the case for hyper-globalisation simply does not hold, as ‘globalization is a tendency that has, in the majority of cases, been swamped in recent decades by a regionalizing counter-tendency’ (2016, p.309). 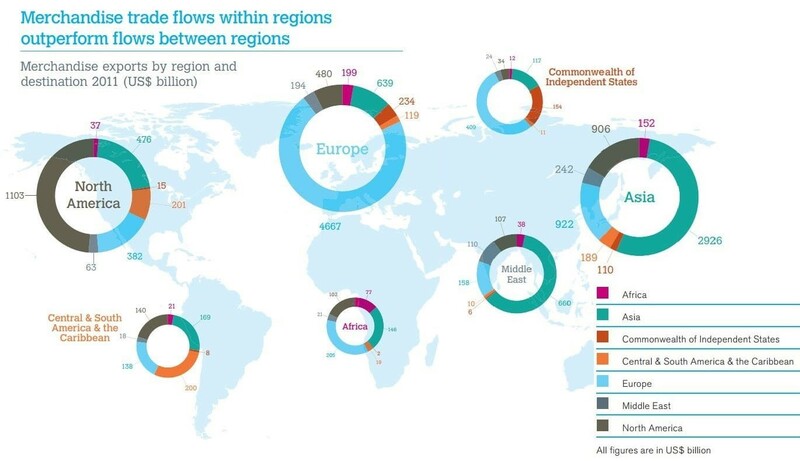 The following graph from the World Trade Organisation’s international trade statistics 2012 illustrates how trade flows within regions are far greater than trade flows between regions.